Herndon, VA — Volkswagen Andretti Rallycross is proud to present its pair of Beetle GRC challengers for the 2017 Red Bull Global Rallycross championship at the Chicago Auto Show. Back-to-back series champion Scott Speed will celebrate a new partnership in 2017, driving the red, white, and green No. 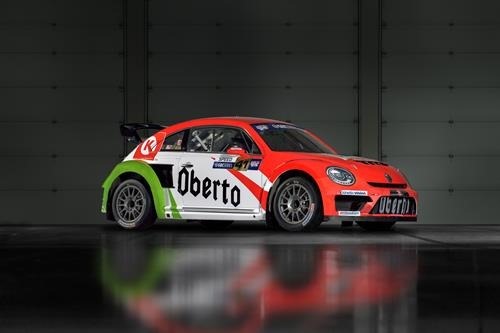 41 Oberto Circle K Beetle GRC for the majority of the season, while two-time GRC champion Tanner Foust will return to action in a newlook No. 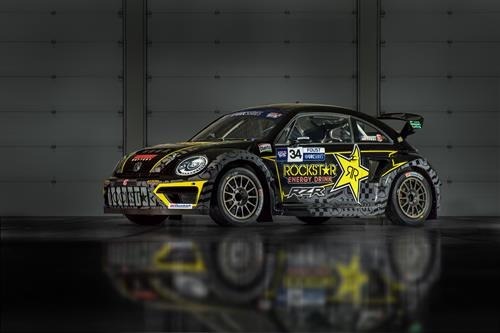 34 Rockstar Energy Drink Beetle GRC. The championship-winning drivers will return for their fourth season with the Volkswagen Andretti Rallycross team, hoping to achieve similar levels of success to their 2016 campaign. Last year, Speed won his second-consecutive Red Bull GRC title, while Tanner Foust set a record of 25 consecutive Heat wins on his way to a second-place championship finish. Speed will welcome Oberto All Natural Beef Jerky and Circle K onto his No. 41 Beetle GRC on a more permanent basis this season. Previously, the company’s branding appeared on Speed’s Beetle GRC for the Seattle round of the 2016 championship. In its brief, three-year history, the Volkswagen Andretti Rallycross team has swiftly become a dominant force in Red Bull Global Rallycross. By winning eight of 12 races in 2016, the squad earned Volkswagen its first ever Red Bull Global Rallycross Manufacturer’s Championship and achieved a second-consecutive driver’s title for Scott Speed. Overall, the team has amassed 18 wins and 16 other podium finishes in the series. The 2017 Red Bull Global Rallycross championship will consist of 12 races spread across eight venues across North America. The season will begin Saturday, April 29 in Memphis, TN. For more information, visit @grcseries or http://www.redbullglobalrallycross.com. Founded in 1955, Volkswagen of America, Inc., an operating unit of Volkswagen Group of America, Inc. (VWoA) is headquartered in Herndon, Virginia. It is a subsidiary of Volkswagen AG, headquartered in Wolfsburg, Germany. VWoA’s operations in the United States include research and development, parts and vehicle processing, parts distribution centers, sales, marketing and service offices, financial service centers, and its state -of-the- art manufacturing facility in Chattanooga, Tennessee. 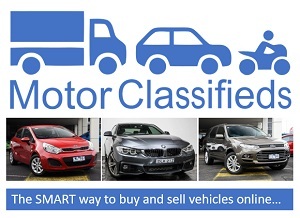 The Volkswagen Group is one of the world’s largest producers of passenger cars and Europe’s largest automaker. VWoA sells the Beetle, Beetle Convertible, CC, Eos, e-Golf, Golf, Golf GTI, Golf R, Golf SportWagen, Jetta, Passat, Tiguan and Touareg vehicles through approximately 652 independent U.S. dealers. Visit Volkswagen of America online at http://www.vw.com or media.vw.com to learn more. Based in Indianapolis and led by racing legend Michael Andretti, Andretti Autosport boasts a wide racing portfolio rooted in tradition and designed for success. Together with Andretti Formula E and Volkswagen Andretti Rallycross, Andretti Autosport fields multiple entries in the IndyCar Series and Indy Lights, along with entries in the FIA Formula E Championship and Global Rallycross. The company boasts four IndyCar Series championships (2004, 2005, 2007, 2012), two Indy Lights titles (2008, 2009), one Pro Mazda championship (2013) and one USF2000 championship (2010) and has captured victory at the famed Indianapolis 500 four times (2005, 2007, 2014, 2016). Additionally the team holds two X Games Gold Medals and two Global Rallycross championship (2015, 2016). To share in the Andretti story, please visit online at AndrettiAutosport.com and follow along on Twitter via @FollowAndretti. Kia’s Sorento GT line is a masterstroke.